Many men turn to the power of hair clippers to obtain a great haircut. Hair clippers may seem a little daunting at first if you're trying to give yourself or someone else a haircut at home. Professional hair stylists may use hair clippers or a clipper over comb technique to create a short, tapered haircut. Clippers -- not to be confused with razors -- generally come with 10 clipper combs. Each comb results in a specific length, which is usually labeled on the comb. 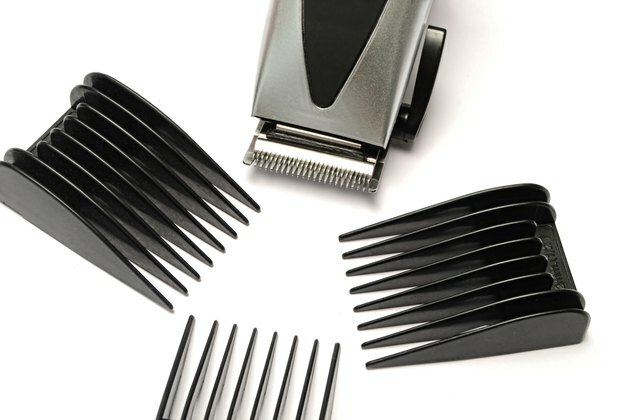 Each clipper comb displays a specific number. As the number gets higher, so does the length of hair that will be left behind. Choose the No.1 clipper comb for the shortest haircut, and go for No. 10 if you want to keep your hair on the long side. Stylists may use a variety of clipper combs to create a tapered haircut, which is when the length goes from long to short. Men may prefer the hair to be very short around the neckline, with longer hair toward the top of the head. It's very important to make sure that a clipper comb is securely attached to the clipper, or it may fall off during a haircut. This may result in a bald spot if a clipper comb is not secured tightly. When placing a clipper comb on a clipper, listen for a snapping or clicking noise that lets you know the clipper comb is securely in place. To create a haircut that is tapered, start with the longest desired length first. Some hair stylists use scissors in combination with clippers to create longer, texturized hair through the crown and mid-sections, while the sides and back of the hair are tapered using clippers. As a general rule of thumb, start with the longest clipper comb first, which will be the one with the highest number. This will create an even, more blended look. If you're not sure what length to ask for when requesting a clipper cut from your stylist, ask her for guidance. A No. 1 clipper comb is 1/8 of an inch. No. 2 combs are 1/4 of an inch and No. 3 clipper combs are 3/8 of an inch. A No. 4 comb is a half-inch long. If you want your hair to be any longer than these lengths, you may benefit from either a clipper or scissor cut.